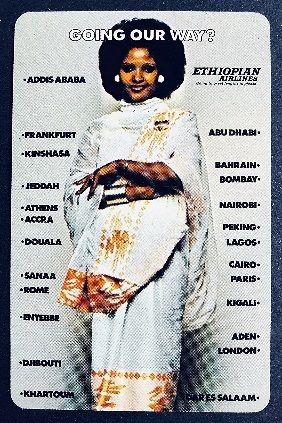 Promotion of new destinations has always been popular topic for playing cards issued by the airlines for obvious reasons. 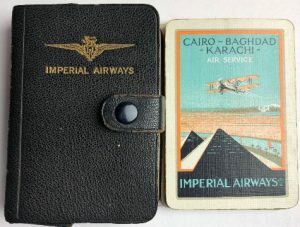 Perhaps the most iconic are the late 1920’s Imperial Airways designs showing an Imperial Airways biplane over the Egyptian Pyramids on the multistep flight from London to Basra, Iraq. Some of these cards were issued in a neat little leather holder with a snap closure. The Imperial Airways and logo were hot-stamped in gold on the surface of the leather. 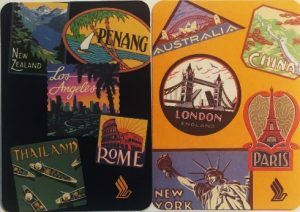 It is the years after World War 2 that destination cards became more popular, the result of passenger aviation changing from focusing on transporting businesspeople and movie stars, to the larger aircraft when promotion of taking families on vacation became an important goal. No doubt, the introduction of the wide-body aircraft and the Boeing 747 in particular bought prices down and started the upward surge of passenger traffic on the airlines. 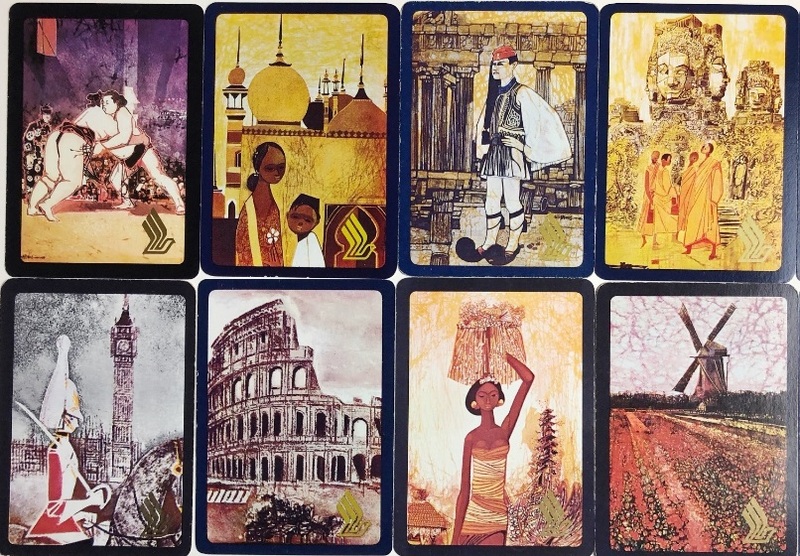 In the late 1960s and through the 1970s, Singapore Airlines contracted with local artist Seah Kim Joo to paint a series of destinations Singapore Airlines flew to in the 1970’s. The designs to the left are just part of the series – take a guess what destinations they represent. The Seah Kim Joo playing cards are popular with collectors as there are multiple variations in the colors and designs with later printings. 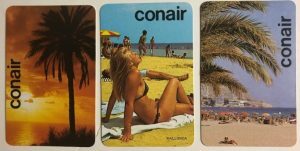 Scandinavian airline, Conair, has issued a series of playing cards showing vacation destinations. Most of these cards have design variations as well, so a serious collector needs to hunt to find them. St Louis-based Ozark Airlines had a wonderful set of playing cards featuring cities and states they served. What is of further interest is that Ozark had two versions of each destination, usually a color change of the graphics. 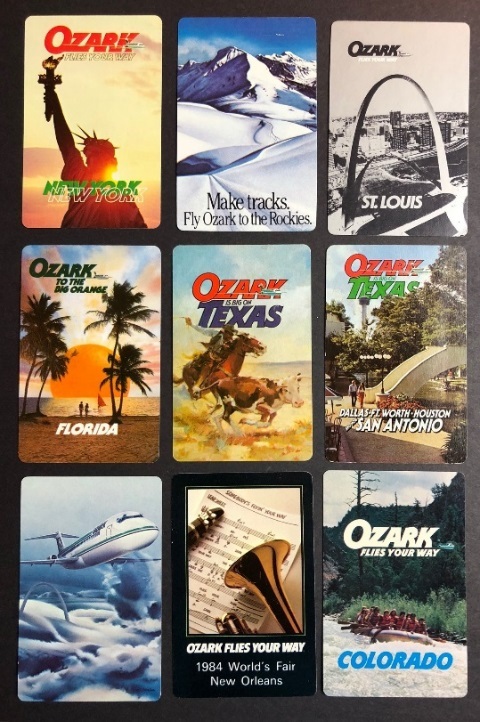 Ozark Airlines, based in St Louis was purchased by TWA in 1986 but their playing cards can still be found rather easily on Ebay and at airline collector shows. 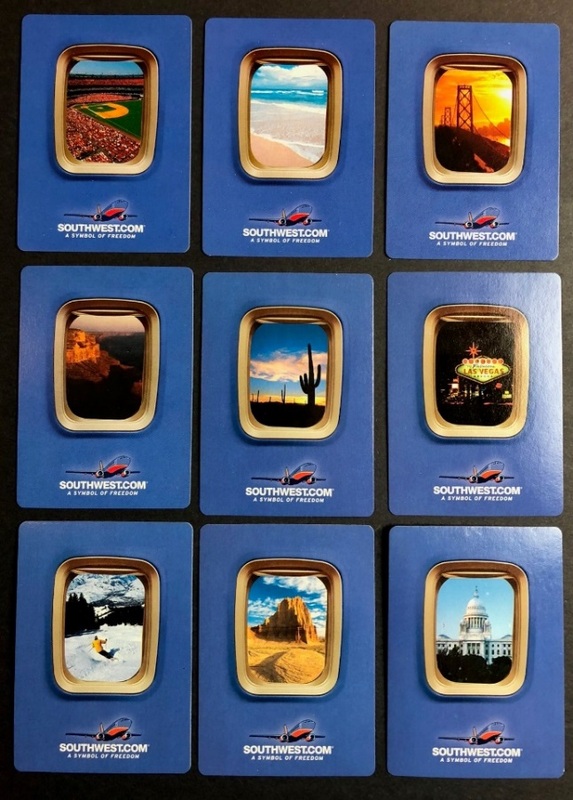 The cards below were issued relatively recently by Southwest Airlines. 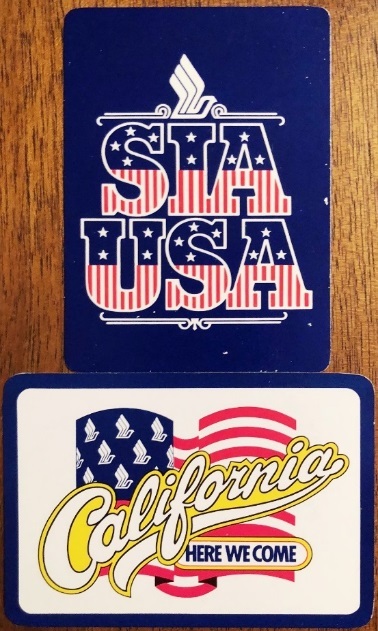 There were two different decks published. This is just a few of the many destinations they showed, all framed by the aircraft window. 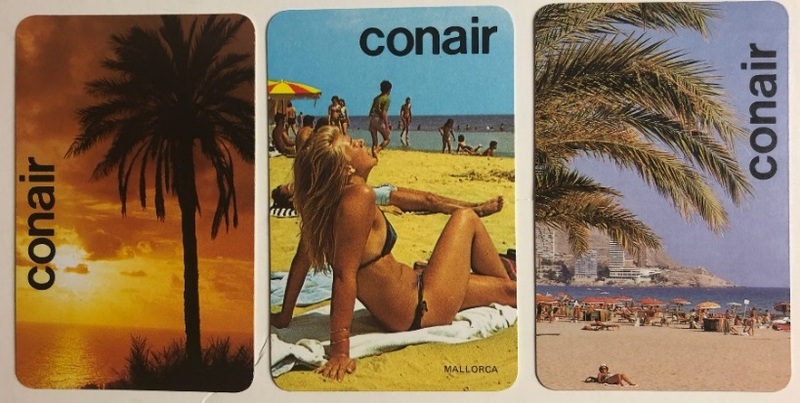 Most airlines have promoted destinations one at a time on their playing cards. But what do you do if you want to promote a multitude of destination at one time. 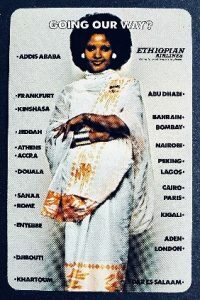 Ethiopian Airlines decided to put an attractive flight attendant on the card standing against a listing of many destinations served at the time by Ethiopian. 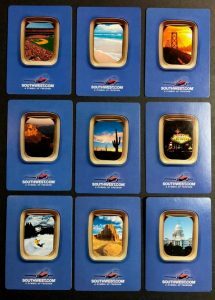 Far Eastern Air Transport, an airline based in Taiwan has issued a series of exotic destination playing cards – Phuket, Bali, and Palau. 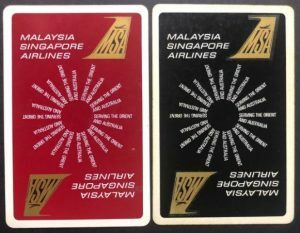 When Singapore Airlines started flights to the U.S.A. the airline issued two decks of cards to celebrate the occasion. 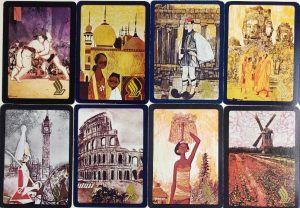 Subsequently, Singapore Airlines issued playing cards to highlight some of the many destinations it flew to. The cards at the right feature Las Vegas, Chicago and Moscow. To highlight multiple destinations, Singapore Airlines issued two decks with destination baggage labels. 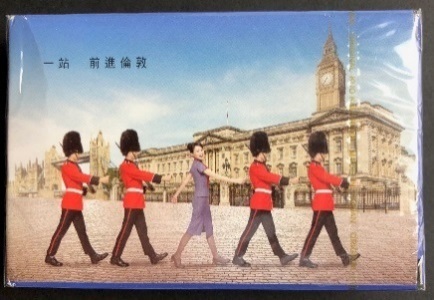 China Airlines, the most prolific issuer of playing cards by any airline, have issued a number of decks promoting service to new destinations. This 2018 issue highlights their London destination. China Airlines has issued several hundred different designs of playing cards covering a wide range of topics. This grouping consists of structures in various cities served by China Airlines. From the left. Osaka, Japan, Sky Tower, Auckland, New Zealand, and buildings in two major Taiwanese cities – Kaohsiung, and Taipei. 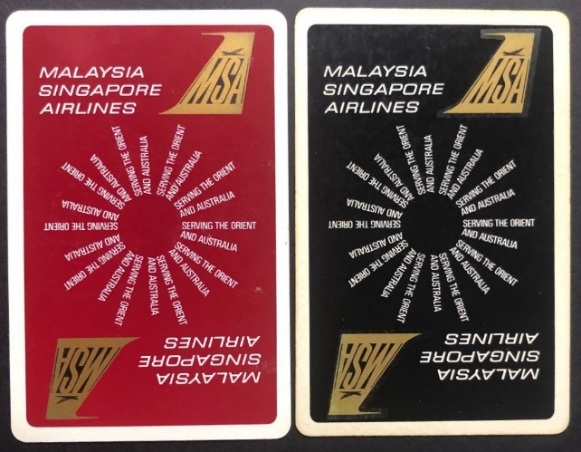 When Singapore and Malaysia combined their National airlines for around a year in 1966, the airline – MSA for short, issued four different decks of cards where their destination focus was displaying like spokes in a wheel. All four of these cards are hard to find. 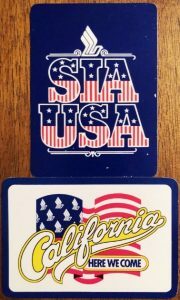 In that short period of time MSA issued several more decks of playing cards, all of which are difficult to find today. Now, as separate airlines again, both Malaysian and Singapore airlines cover the world.